Rich: "I think you’re wrong about this...I think the physical space is critical..."
Me: "Seriously? You think space comes before culture? " Rich: "Yeah. I think the space enables the cultural change." We were riding together in Rich’s Saturn VUE, about 120 miles into a 250 mile trip to Chicago. We had been talking about an article I had been asked to write about building out agile workspaces. This article, in fact. I had been rolling over ideas in my head for a while. The more I thought about constructing workspaces for agile teams, the less important the physical characteristics seemed to me. I thought that if all you do is rearrange your furniture, you’re likely not going to be successful. Yet at the same time, I had to admit that Rich was probably right too. If you change a bunch of things about how your team operates, but keep them sequestered in cubes and private offices, you’re likely not going to be successful either. This is obviously an issue with some complexity. Virtually all my "agile experience" comes from working at Menlo Innovations in Ann Arbor, Michigan. 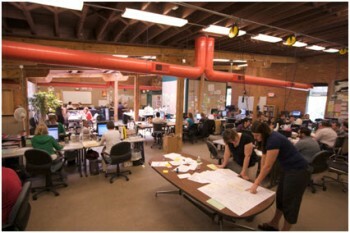 Our current space is approximately 4,500 sq/ft. and we’ve been here for almost 5 years. The initial build-out for the site was actually a tear-down. We removed all the non-structural walls to convert many different small storage spaces and private offices in to a single, contiguous space. We’ve chosen to cover the walls in homasote, a cellulose-based fiber wallboard similar to corkboard, but the material isn’t as important as its purpose. 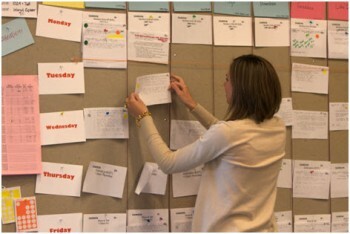 We use it so we have a way to tack up the week’s story cards along with other important project artifacts. This is vital because it provides easy access to project-related information and helps us practice transparency within the organization. Because we keep all of this information public, we don’t bother the team with, "Hey! What are ya workin’ on? Are ya done yet?" The walls also provide a place for fun, inspirational, and creative posters that remind us and our visitors and clients of who we are. For example, the biggest poster on our wall reads "Make Mistakes Faster!" This mandate supports the culture of innovation and exploration we’ve built and reminds our team members that it’s okay to make a mistake, that errors are not fatal. There are also numerous white boards. 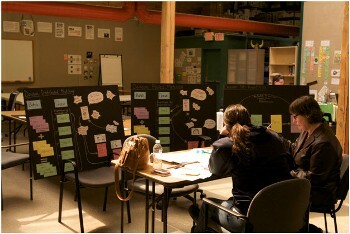 This provides an informal gathering place for the team to brainstorm, problem solve, and share knowledge. We even have one that can print the contents of the white board, but more frequently we just shoot a digital picture for future reference. The space needs to be reconfigured regularly as projects end, new projects begin, or current projects change size. To ease the strain on our aging backs we’ve chosen lightweight but strong five-foot AluLite™ aluminum tables. By keeping the tables uniformly sized, you can easily add another table or two to a project pod. Because they’re lightweight, the burden of reconfiguration is low. This means project teams - or even clients - can pull a few tables together to work for a few hours, a few days, or a few months. The first problem we have, much like other organizations, is chairs. Everyone wants a different style of chair and has different needs. We’ve found it best to have a variety of chairs available, including some non-rolling chairs. Another problem is storage. We have tried file cabinets (too immoveable). Rolling cabinets (too small). IKEA baskets (not bad, but labor intensive to assemble). Built in storage benches (became dumping grounds). What we found was that more visibility into the contents of the storage unit was important so that project artifacts are easily accessible and regularly archived. For now we’ve settled on a wall of lockers to contain personal items and bags and are using the IKEA baskets and shelves to store project artifacts. Have faith - we’re not done iterating on that particular problem yet. Finally, we’ve included pull-down power and network drops from the ceiling. This increases our flexibility because we are no longer tethered to posts or floor outlets. It also increases safety because we’re not running cables across the floor. While helpful to facilitate physical interaction, none of these physical characteristics answers the question: Does space enable culture? Our experience tells us that most organizations are not intentional about their culture, but often inherit a "default culture" that is derived from history, hiring practices, accepted behaviors (good and bad), experiences, and yes, the physical space in which the organization exists. Once an organization decides to make an intentional change to their culture, they must look at everything. At Menlo Innovations we had the luxury of starting with an intentional culture. We decided on several key elements of that culture right from the start. These included transparency, openness, energy, engagement, sharing, flexibility, efficient communication, informality, access, helpfulness, mentoring, cross-training, laughter, noise, work, and visible accomplishments. While we would have the same cultural values no matter our environment, we wanted to ensure that our space would not interfere with our culture, therefore making sustainability easier. What more can we ask of our space? We are frequently asked how we know the space is working for the team. I’m a show-and-tell kind of gal, so I like to offer an invitation for anyone to visit so they can judge for themselves. (We currently have about one "tour" a day, so a lot of folks have taken me up on the offer!) But you know what I really love? If something in the space isn’t working, the team is empowered to change it. Need more space? Different chair? Don’t like the pod configuration? Change it! It’s amazing how much easier that becomes when you don’t have to wait for a Millwright, search for the right-sized Allen wrench, or ask permission. This type of workspace can be mentally stimulating with an infectious energy, but there are still some problems we’re trying to solve. One problem is instilling a sense of stewardship over the whole space, so that common areas (like the kitchen) aren’t seen as "someone else’s problem." It may not be glamorous, but loading and unloading the dishwasher are part of maintaining a healthy environment. It’s not that we don’t have a cleaning crew. We do. But when 50 people share a space, there are just days when the space needs a little extra attention. One of the earliest memories I have of working at Menlo is coming in at 7:00 am and finding Rich - the company President, mind you - emptying the trash because it needed emptying. That simple act instilled something very important in my mind: In a successful team, there are no tasks that are beneath you. You have doubts about this, don’t you? You have questions. You’re thinking, "This all sounds great, but what about the problems? Tell me about the problems!" It is loud. When you have 50-70 folks in a room all talking with their partners, or having whiteboard discussions, or disagreements, or even laughing and enjoying themselves, sometimes it’s REALLY loud. What we’ve seen is that there’s an adaptation period of about three weeks for new team members, while their brain habituates (i.e. adjusts) to the new environment. There’s actually some physiology at work here. The part of the brain that makes you notice some things but not others is called the reticular formation. (Check it out on Wikipedia if you want to know more about the science bits. Also check out "Cocktail Party Effect" while you’re there.) The short story is that once your brain habituates, it can filter out stimuli that are irrelevant for you and likewise raise your attention when relevant stimuli occur. Irrelevant, like someone discussing plans for the weekend. Relevant, like someone saying, "Well I’m just going to delete that suite of tests..." or even simply saying your name. Unfortunately, not everyone is able to make that adaptive leap. We’ve had some talented folks come work for us that ultimately couldn’t adjust to the noise and lack of personal space. We’re okay with that. We know that our environment won’t work for everyone. Note that this isn’t to say there aren’t times when folks need a few muted moments of quiet to collect their thoughts. When that’s the case our usual recommendation is 1) take your partner with you, then 2) take a walk around the block or go get a cup of coffee downstairs in the coffee shop. In a crunch, if someone really, desperately feels the need for some "library quiet" they have two options: 1) they can go sit in the area we've reserved for headache victims and lactating mothers (i.e. comfy chair, soft lighting, relatively quiet space) or 2) we share a small bit of our office space with another company that has a sound-dampened room - we simply ask them if we can borrow it for as long as we need. Truth be told, it really doesn't come up that often. This is likely because we actively recruit for cultural fit first and part of that culture is working in the open, shoulder-to-shoulder with your teammates, with a pair partner, all day long, every day. The lack of "library silence" can make meetings a challenge. While our daily standup meeting is no trouble - we have a single standup (of about 15 minutes) where all team members (from all project teams) and any visitors participate - finding space for small meetings, or meetings with clients, can be...interesting. Honestly, the challenge with clients (particularly new clients) is that the noise and energy of the space can be overwhelming. While we do have a conference table tucked into one corner of our space, it’s not used very often. Our preference is to start exposing clients to our work environment as soon as possible. After all, our expectation is that they are going to come in at least once a week to work with the team on planning and to work through show & tell. We recognize that it’s not a perfect system. More than once it’s been suggested that maybe we need movable walls, or flexible partitions. While that would likely help reduce noise, it would also reduce serendipity. We’re counting on teams overhearing one another. Culturally, we believe this exchange of knowledge across projects is a big factor in our success. We expect it to occur within the pair, within the project pod, and across projects. This builds knowledge on all projects within all team members. In other words, everyone here knows at least a little of what’s going on with every other project, even me. And messiness? Yeah. That’s a problem. Again it’s an issue of stewardship of the space. Sometimes the team just needs a reminder to clean up. We’ve been in our current space almost five years and our space continues to change, grow, and evolve. We’ve hung more homasote and white boards on the walls. We removed a staircase and joined the floor so that the space would be contiguous. (Yes, we found that even a mere 15-foot gap was interfering with communication!) We added a kitchen. As our needs change, the workspace changes. 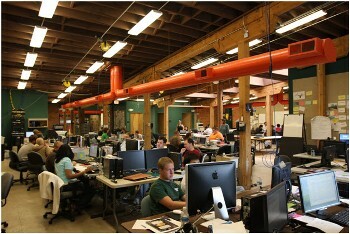 We recognize that the workspace we built 10 years ago wouldn’t work for the organization we are today. Sometimes the workspace we built 10 days ago is no longer the right workspace, so we change it. One unexpected benefit of our workspace is the excitement it generates with our clients. There are many clients who ask, "Can I just hang out in your space and work on my stuff? I promise I won't bother anybody!" This is a common occurrence and one we fully support. Many of our potential clients have heard about our unique space, so when it comes time to talk to us about their project, they offer to come to our place instead of asking us to come to theirs. This adds to the team's own pride in their workspace and adds to the joy they experience everyday by being part of Menlo Innovations. I’d like to leave you with a final thought as you consider your own workspace. To paraphrase Churchill: We form our spaces, and then our spaces form us (for good or for ill). Make a positive, constructive, or fun change - even a small one - in your workspace today. You’ll be happy you did and the results just might surprise you. Lisamarie Babik (Evangelist) has travelled the USA, Canada, Panama, and Mexico speaking about Agile and its relationship with formal project management. She has been working full-time with Agile teams for more than seven years and has more than two decades of experience in the software industry. (She's older than she looks!) She is certified by the Project Management Institute as a Project Management Professional (PMP). Richard Sheridan's (President & CEO) team at Menlo Innovations breaks all the rules and, in doing so, produces phenomenal results for its customers. No walls, offices, doors or cubes -- one big open room, a la Edison's original invention factory in Menlo Park, New Jersey. In this noisy, fun atmosphere Menlo has produced software for all walks of industry from health care, to scientific equipment, to high-fashion ecommerce, to diesel motor vehicle diagnostics, and many more. Sheridan and his team regularly are invited to present nationally and internationally sharing the secrets of the Menlo Software Factory™ with all who wish to learn how to build a Learning Organization that can keep pace with today's advances in software and design. He has been working with Agile teams for more than a decade and has recently undertaken a new mission: returning joy to the world of software development. Some thoughts for the future. Re: Some thoughts for the future. 'fraid I would be one of the ones who could not cope with lack of privacy or quiet. Love the article. Do people really use cubicles in the US? I've worked for many different banks over the years and the closest I came was a desk that used to be in a cubicle. You comment about noise took me back. My first job on a trading floor had me sitting next to a Polish Zloty trader who paced around screaming into his phone all day. I could not understand why no one else complained. After four days or so I learned focus and got on with with my work. My ex-wife hated this ability to ignore a screaming child sitting next to my feet. The Investment Banks are past masters at creating the kind of space you describe ( Check this link www.advancedtrading.com/photos/trading-floors/u... ). 1. Natural lighting. Warehouses might be cheap but they are not built for human storage. Get some skylights. 2. Most managers sit on the trading floor but also have offices they can use when appropriate. Do you want your boss dicussing your bonus/personal issues with HR where everyone can hear? I would recommend a read of the Christopher Alexander books for an understanding of public and private spaces. Unfortunately, many companies are still using cubicles. Much like you point out that warehouses are not built for human storage, I don't believe cubicles are either! Our space fortunately has some measure of natural light coming in (hard to see in the pictures) -- a handful of skylights and some windows. The irony is that the team has requested that we put up blinds or curtains because the light can be too strong at times. As for for public/private space issue... Do I want my boss discussing my bonus where everyone can hear? Menlo is a curious place. Everyone knows what everyone else earns, based on what their level is. For example, I am a consultant III. Gabe is a consultant I. He knows what I earn. I know what he earns. Now do I want my boss discussing the finer details of my HR difficulties out in the open? Probably not. What typically happens is that we retreat to a table that's away from others and we talk. Alternately, we might head down to the coffee shop on the 1st floor of our building. Or we might head into the back office of our parent company -- which has an office but no door -- and talk there. As a last resort, we might ask to borrow that sound-dampened room from our neighbors. I suppose the key here is that we've built a culture where trust is of the utmost importance. If we didn't have trust, we wouldn't feel comfortable with this level of openness. I'll check out the Christopher Alexander books. Thanks for the recommendation. Oh, and the trading floor pics? WOW. Thanks for sharing! There are many people who fall into that category. After 7 years doing it, I still have occasional days where it feels overwhelming. Do you have specific Christopher Alexander books you would recommend? "The Timeless Way of Building" is a delight to read ( but not easy going ). "A Pattern Language" en.wikipedia.org/wiki/A_Pattern_Language is a lovely book to dip into. Each pattern is only a page or two. Christopher Alexander was the inspiration for the Software Patterns Movement, part of which evolved into the Agile thingy. Of course it feels overwhelming. Am I the only one who thinks this is a bit extreme? I mean c'mon enough of this non sense hate against cubicles. Every decision in life involes tradeoff. Open communication will always come at the expense of personal privacy and the ability to focus on your work. Therefore, removing all physical separation is a bad choice in most situations since people will have trouble not being disrupted. Your team should try to find the right balance instead of thinking in terms of 1 and 0. I very much appreciate your commentary. Here at Menlo Innovations, it is very much a "1" or a "0" regarding an open and collaborative workspace with no private offices or cubicles (even for me the CEO!). I share a five foot table with Lisamarie (I hope its not me that overwhelms her, but that's entirely possible, sorry Lisamarie!). Even our backoffice, which by accounting standards needs a separate office, found that such a stipulation did not say you needed a door, so they went without! I very much appreciate too that our approach is not for everyone and we certainly don't advocate that it should be. It is simply an intentional cultural choice we have made. It probably means we've lost some candidates who otherwise might have been able to contribute here but decided against it for the same reasons you have elaborated. We are OK with that as we couldn't imagine such an accommodation here after 10 years of being this way. Are there inefficiencies? I'm sure there are ... but the benefits of the energy, the transparency, the efficiency of High-speed Voice Technology™ instead of email, the camaraderie, teamwork, flexibility and serendipity far outweigh (in our opinion) those inefficiencies. Our team would actually rebel if we started throwing up partitions! I recall several years ago when we needed more space, we contemplated (as owners) leasing the floor just below us and being connected via an open stairwell in the middle of the room. The team implored us not to do it as they were quite concerned about the impact on our culture of no longer being within eyeshot and earshot of one another. We canceled the plans. Interestingly, this choice has actually greatly improved our ability to recruit talent. So many in our industry are saddened by the loneliness and isolation that occurs (and graduates of CS programs fear it). In ten years, we have never had to advertise positions as word of mouth of our unique and joyful work culture attracts so many we always have a great choice from those that show up on our doorstep having heard about us. We also do, on average, a tour a day, and many of our tour visitors have begun their own experiments in modeling our environment. Many have quite successfully implemented pieces and parts of what they have seen here, even in non-IT industry segments. My broad advice is simply to be intentional about your culture, as the "default culture" is often the greatest inhibitor to the power of "team". For us, that includes an open and collaborative work environment. We are proud of what we have, and share our experiences with others whenever asked. We also know that sometimes our enthusiastic description implies that we have found the "one true way" of working and that everyone should be like us. That couldn't be further form the truth! If you have something that is working well for you and your team, you should only experiment with enhancements you think would make it better. For those that are curious about what such an environment we be like, we offer our free and paid tours so that they can see it in person and interact with the people who work here. I'd enjoy the chance to have you in for a tour some time! 1) Yes, space is important but culture is more important; no impediment can't be overcome by a team impassioned with the right (cultural) attitudes. But if you have cubicles, rip them out ASAP or find another space and use tables like they do here. Psychologically, cubicles are just as inflexible and forbidding as walled offices. 2) Culture is 'caused' by the leader: A charismatic leader(ship) is the center of every successful team culture. A good, charismatic leader creates a winning team from what would otherwise just be some space, some stuff, and a bunch of people. If your organization doesn't (or won't) have this kind of leadership then don't bother with the furniture, etc. Inertia will always win in this case. 3) Successful team cultures like this can be unusually susceptible to being 'poisoned' by passive-aggressive, psychotic management infiltrations crawling in from the corporate world (or installed by investors). Don't be fooled by appearances!!! And then see #4 next. 4) Obviously, not everybody fits in. The culture needs to have a quick and effective detection and purge mechanism for those who aren't adapted or adopted. Like it or not, a healthy team culture is a cult. Anyway, while it would be nice if we could just adopt a bunch of good agile practices to achieve this kind of result, it seems unlikely to happen in any large organization except perhaps by a 'skunk-works' approach. IMO the key to this will always be in the leadership's ability to really be leaders, constantly creating and sustaining the culture.